During the wave of tornadoes that swept the Plains last night, a few touched down in the Dallas-Fort Worth area. 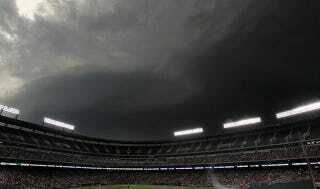 Damage and casualties were limited, but there were some scary moments as a line of storms approached Rangers Ballpark in Arlington in the middle of the game. The game was stopped before the rain started and the 35,000 fans evacuated either to the concourses or to the tunnels underneath the stadium, just in time for golf-ball sized hail to pummel the field. The game would resume after a three-hour delay. Here are some of the videos we've found of fans heading for cover and wild weather pounding the stadium: we'll update with more.